Take Highway 16 to Gig Harbor, exit at the “City Center/Wollochet Dr Exit.” This exit takes you to Wollochet Drive. If you are traveling westbound on 16 towards Port Orchard, you will take a left at the light at the end of the exit. If you are traveling eastbound on 16 towards Tacoma, you will take a right at the light at the end of the exit. Once on Wollochet, go .5 miles to 6506 Wollochet Drive NW Building #B. Our office is in the building on your right, just past Mallard’s Landing office complex. I am here today, in my opinion, as a result of Dr. Gruber's chiropractic adjustments. Almost instantly Dr. Gruber and his treatment gave me tremendous relief. I will never stop having adjustments because I know one thing for sure -- I WILL ALWAYS STAY ON A REGIME OF CARE FOR MY BACK BECAUSE IT WORKS!! I consider finding Dr. Gruber an answer to prayer and credit the treatment I have received from him with giving me my life back! The patient is pain free and has not had to take medication since the immediate chiropractic treatment. Overall the chiropractic treatment has been very successful and has achieved more than its initial objective. I am a very active person and when my L4-L5 disc became herniated I was basically crippled and disabled. Thanks to the chiropractic adjustments, I'm still able to be athletic and enjoy outdoor activities just as before my injury. I realize I'll have back and neck pain for the rest of my life, but with chiropractic care from Dr. Gruber at Gruber Chiropractic, it really makes a difference in my day to day life. Dr. Gruber has helped me a lot... He has done more for me than all the doctors and therapists combined. He hasn't cured me but he sure has made it a lot easier to live with. 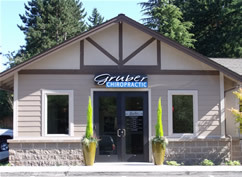 Dr. Gruber is very knowledgeable and professional, and truly cares about his patient's progress.